Last week the pair reached the lows recorded two year ago. USD/CHF has been in the descending channel for quite a long time and it is possible that the pair will continue trading in the range of 0.8980-0.9075 amid budget crisis in the USA. The lower boundary of the channel is a strong support level, which will prevent further decline of the pair. Nevertheless, if the USD continues to weaken and this level is broken down, the decline can reach the level of 0.8500. At the moment the pair is trading near resistance level of 0.9075, which coincides with the level of 23.6% Fibonacci. Next resistance levels will be 0.9130, 0.9180 and 0.9270. Support levels: 0.9880 and 0.9850. It makes sense to open long positions in case of breakdown of the level of 0.9075. 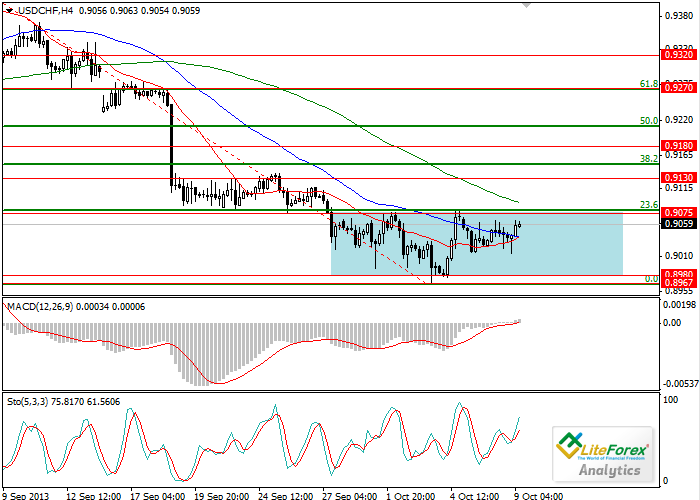 Short positions are recommended if the pair consolidates below the level of 0.8970. S&P500: will the correction continue?